Our Mylar films have extremely low Oxygen Transmission Rates due to a foil layer that is thicker than imports and competitors. The thickness of the film overall is not as important as the thickness and quality of this metalization when it comes to long-term food storage. That is because oxygen cannot penetrate metal. And strength? Even one square inch of our Mylar film can support the weight of two and a half cinder blocks! The bags have a superior structure in the areas that really count for Long-Term Food Storage, are longer (8 x 12 vs. 8 x 8) for easier sealing and hold a full quart plus some. 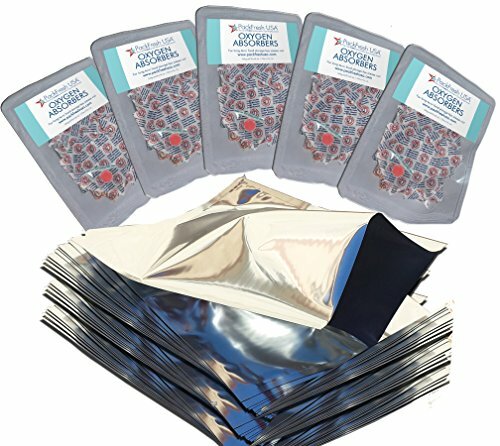 Although this industry is dominated by imported "mylar" films and bags from China, PackFreshUSA uses local manufacturing facilities and suppliers We do not pay any shipping charges, and that is how we can afford to provide quality American materials at import prices. Convenient 10-Packs allow you to open smaller quantities at a time, reducing exposure, waste and the need to reseal those you are not using. High capacity 300cc OAPs are appropriate for all food types, including pasta, potato flakes, and others with high air volume. Our OAPs also absorb 180 to 300% of their rating, giving you a buffer of safety, and oxygen indicators guarantee freshness. This 3rd edition contains directions, more information and tips, plus a new section on a process to avoid freezer-burn. You are always welcome to send us your questions as well!